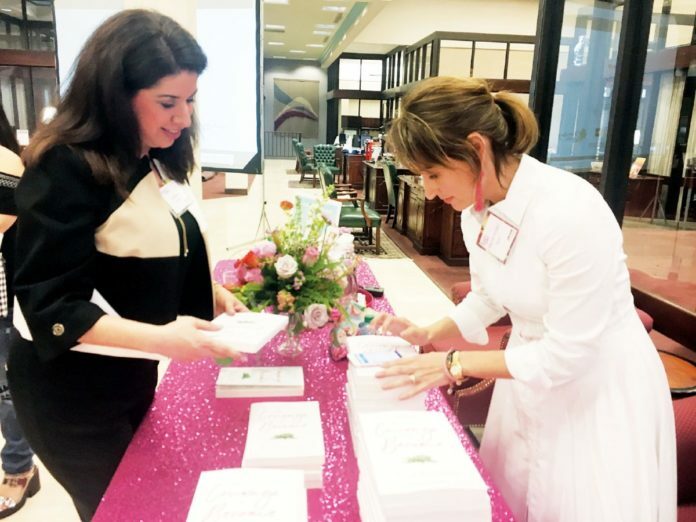 McALLEN — A red carpet stretched from the front doors of IBC Bank in downtown McAllen Thursday night to lead the way to its inaugural “Women of Purpose” social. Created to celebrate women of the Rio Grande Valley, the mixer brought together a diverse mix of age, race and backgrounds in the bank’s lobby. When asked to help plan and arrange a guest list for the event, dozens of women came to mind for Dora Brown, the bank’s senior vice president of marketing. “You name an industry, we have it represented here,” she said. More than 225 judges, directors, doctors, nonprofit founders and other female leaders gathered Wednesday evening to mingle, inspire and become inspired. Women exchanged laughter and business cards across standing tables covered with bright tablecloths. Glasses of champagne were raised into the air between old and new friends. Brown walked to the stage, which featured pink glittery curtains and was adorned with paper flowers, to share her excitement and thank all in attendance for playing a role in helping South Texas thrive. The mostly female planning committee was especially recognized for their contributions. Many agreed 2018 is shaping up to be an important one from women. Roles are being filled by women in larger numbers as society is widening the platform for their voices to be heard, noted Dru LaMantia. Atop the stage, she clamped the microphone between her palms and shared parts of her journey in navigating life and motherhood. The speech emphasized the need for women to choose joy, discover how to walk confidently with their purpose and not be afraid to ask for help. “Asking for help is a sign of humanity,” said Hernandez Holm in her speech. Guest Maria Rosalba Becerra migrated to the United States from Mexico, she said, with absolutely nothing. Now Becerra owns and operates the freight forwarding company Cross Point Forwarding and said she was able to shape her success by staying focused, taking risks and trusting in God. Before saying goodbyes, everyone huddled toward the center of the room for a group photo shot by a handful of photographers from the upstairs balcony. Prizes were awarded through raffles at the end of the night. Yeti cooler winner and senior business development officer of LiftFund, Marlene Rodriguez, felt appreciative for the opportunity to network with other female community leaders. “We have to raise our voices in order for us to be heard,” Rodriguez said. The story has been changed to reflect that Dru LaMantia is not the owner of Barn White. The owners of Barn White are Leslie Ewers and Page Friedrichs Moore.